The stability of joints is a topic of great clinical importance; it explains why some joints are more prone to dislocation and injury than others. It also underlies the clinical basis of treating joint injuries. In this article we shall look at the various factors that contribute towards joint stability. The joints of the body come in all shapes and sizes. The most important factor to consider here is the relative proportion of the two articulating surfaces. For example, in the shoulder joint, the humeral head of the upper arm is disproportionately larger than the glenoid fossa of the scapula that it sits in – making the joint more unstable, as there is less contact between the bones. In contrast, the acetabulum of the pelvis fully encompasses the femoral head, and this makes the hip-joint far more stable. However, whilst the hip is more stable, the shoulder has a greater range of movement. Each joint has this trade-off that is particular to its function. Fig 1 – The articulating surfaces of the shoulder joint. 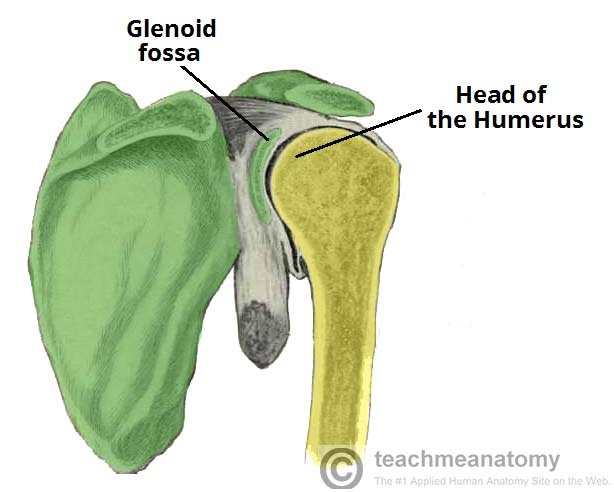 Note how the humeral head is disproportionately larger than the glenoid fossa of the scapula. The ligaments of a joint prevent excessive movement that could damage the joint. As a general rule, the more ligaments a joint has, and the tighter they are, the more stable the joint is. However, tight ligaments restrict movement, and this is why extra stability of a joint comes at the cost of loss of mobility. If disproportionate, inappropriate or repeated stress is applied to ligaments, they can stretch, tear or even damage the bone they attach to – this is why sportspeople are more susceptible to ligament injuries. 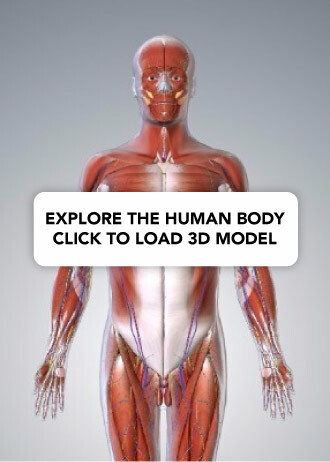 The tone of the surrounding muscles contributes greatly to the stability of a joint. A good example of this is the support provided by the rotator cuff muscles, which keep the head of the humerus in the shallow glenoid cavity of the scapula. If there is a loss of tone, such as in old age or stroke, the shoulder can dislocate. Dislocations of the shoulder joint can tear the rotator cuff muscles, making the patient more susceptible to further injuries. Similarly, the tone of muscles around the knee are crucial to its stability. Through inappropriate or unbalanced training, the knee can be made prone to injury through muscle imbalance. This can lead to chronic pain. Fig 2 – The rotator cuff muscles, which act to stablise the shoulder joint. What is the main reason the glenohumeral joint is so unstable? What is the main function of joint ligaments?